Inspirational leaders supply a shared vision and inspire people to achieve more than they may ever have dreamed possible. People change when they are emotionally engaged and committed. If yes, then you must create an → Inspiring Corporate Culture that → inspires, → empowers and → energizes them. People do what they have to do for a → manager, they do their best for an inspirational leader who turns them to empowered self-leaders. 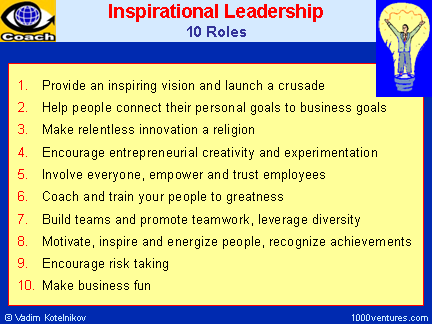 Inspirational leaders supply a shared vision and inspire people to achieve more than they may ever have dreamed possible. People change when they are emotionally engaged and committed. 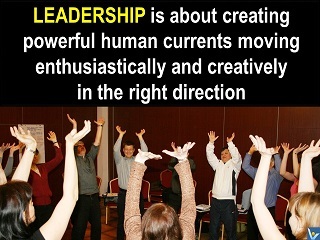 Inspirational leaders nurture 'can-do' attitude and make business fun. They unlock inner power of their people and sustain their commitment. They inspire, energize and move people to → make the vision a reality. They build corporate communities in which people feel valued, capable, confident and strong. They inspire → team members to believe in the extraordinary work they can do together. To inspire, you must both create resonance and move people with a compelling vision. You must embody what you ask of others, and be able to articulate a shared vision in a way that inspires others to act. You must offer a sense of common purpose beyond the day-to-day tasks, making work exciting, advises Steve Farber, the author of The Radical Leap. ❶ Provide an inspiring → vision and strategic alignment, launch a crusade. To become a motivational leader, you start with → motivating yourself. Dreams should be shared. Take every opportunity to inform your employees of your plans and dreams for the company's future.